The Oasis opened in 1983 in Wallington Square and has since served the people of Wallington by providing a bookshop with a good range of books, music and software, pleasantly displayed and efficiently run. We also service about 80 church and school accounts. We sell the Traidcraft range of fairtrade food and confectionery. Our aim is the provision of a meeting ground where both Christians and others may meet and build relationships. We will do this by providing environments where both these categories of people will be well served and comfortable. The Oasis is part of the Wallington Christian Outreach Ltd. Entry Updated: 19/3/2011 | Out of date? Walsall, West Midlands WS1 1DA - moved to Stafford Street, October 2011. The Shrine Shop is an integral part of the shrine, focusing on the needs of pilgrims. 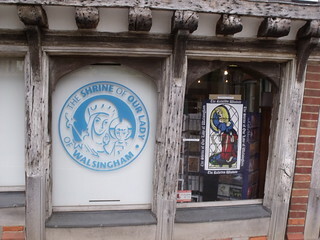 Situated in the very heart of the village of Little Walsingham in The Common Place, the Shrine Shop has long been an integral part of the Walsingham experience. It offers a wide selection of statues, rosaries, crucifixes and icons. More generally the shop sells cards for all occasions and books covering a wide range of Christian subjects. Church silverware and Mass kits are always in stock. Goods are available by mail order as well as by personal visit to the shop. A comprehensive selection of items can bought online.. Entry Updated: 23/5/2012 | Out of date? Entry Updated: 4/4/2010 | Out of date? Apart from the Dundee store, which is operated by CLC Bookshops, Book Aid shops can only accept payment by cash or cheque. Previously trading as Living Oasis, Storehouse Watford is the only branch of the chain that survived the company's meltdown in 2011, which ended with the parent company, Nationwide Christian Trust, entering insolvency (August 2011). Taken over by Living Oasis, now relocated and trading as Storehouse Watford. To glorify God by making Christian literature available to all nations so that people may come to faith and maturity in the Lord Jesus Christ. For other Christian bookshops in the surrounding area please see the County Index » Northamptonshire. Entry Updated: 26/2/2012 | Out of date? Our cathedral shop is situated in the new Entry Cloister located just to the right of the West Front of the Cathedral. It stocks a vast range of products including books, cards, CDs, gifts, pictures, chocolates, Somerset Lavender, tapestries and jewelery. WITH THE EXCEPTION of Weston-super-Mare and Watford (now trading independently as Life WsM and Storehouse Watford respectively), all remaining branches of Living Oasis ceased trading in August 2011 when parent company Nationwide Christian Trust entered administration: Nationwide Christian Trust Enters Insolvency (UKCBD News, 4/8/2011). For a brief period (March 2010 - July 2011) this branch became part of the now defunct Living Oasis chain, which entered insolvency at the beginning of August 2011. The Cornerstone Christian Bookshop have many new items in stock. A great selection of lovely new cards and gifts for all occasions. Entry Updated: 17/11/2011 | Out of date? We are an established retailer of Christian resources and literature. Our products are designed to enhance individual Christian life irrespective of age and background by informing, inspiring and deepening devotion to Christ. Our products include adult and children's books, Bibles, Sunday School resources along with Scripture and Christian literature in a wide range of foreign languages such as Polish, Romanian, French, Portuguese and Yoruba. Photograph courtesy of We are Laura graphic design and art direction consultancy, from the New Windows on Willesden Green project, December 2011. To provide and make available Christian literature and resources which focuses on building, developing and promoting Christian faith in the family, within the community and our nation as a whole. Posters & stationery; toys & games; colouring books, crossword & puzzle books; Gospel music. * closing time subject to seasonal variation - see the shop homepage for details. The Visitors' Centre also accommodates the Cathedral Box Office and Refectory. Entry Updated: 5/8/2010 | Out of date? Home of Oasis Booksearch, for all your secondhand and hard-to-find book requirements, with more than 5,000 items available via our biblio.com store. Sit and relax over a cup of tea, hot chocolate, or coffee from our Flavia coffee machine or enjoy a fruit juice. Fair Trade snacks including Geobars available. Bring a friend for our late night drop-in on Fridays: extended opening until 9pm! Traidcraft products stocked and ordered on request. At St Andrew's Bookshop, a warm welcome is assured and a wide range of Christian resources are available. We can supply products from all major Christian publishers, including Zondervan, Authentic, SPCK, Hodder & Stoughton, SCM-Canterbury Press, Kevin Mayhew, Scripture Union, CWR, Good Book Company, IVP, Lion, Monarch, Candle, Banner of Truth, Day One, Harper Collins, Evangelical Press and Christian Focus. Origin@ChristChurch is the name of our well stocked store which sells a wide range of Christian books and media. If you can't find it, we can order it; either in the shop, or over the phone, for delivery either to your home, or for collection from the shop, most orders come through within 24 hours. Otherwise spend a while browsing the extensive range of books, music, DVD's, gifts, posters, cards and jewelry. There is a particularly good range of Bibles and an excellent children's section. Get on our email list for notification of our regular in store promotions - a real indulgence for bookworms! Previously trading as Wesley Owen from the same premises, this shop reopened independently when the Wesley Owen group was broken up in 2009: What happened to Wesley Owen? Celebrate God's glorious creation by making a day of it and visit Quench in Wokingham (formerly St Andrew's bookshop) with the whole family. Situated in the beautiful Berkshire countryside, yet only a short drive from central Wokingham, you will find Quench in the Holme Grange Craft Village, one of the best rural retail sites in the UK. St Andrew's Bookshop, Wokingham, became part of the Quench Bookshops group in mid-2009. Milton Keynes Christian Books, Stony Stratford (for other Christian bookshops in the surrounding area please see the County Index » Buckinghamshire). ...which will surprise you with its exceptionally wide range of lovely and interesting things! Books and guides not only about Worcester but other cathedrals, abbeys and churches, history, music (especially Elgar! ), Christian books, bibles, prayer books and hymn books. Also a comprehensive selection of children's books. CDs - we have an exceptional range of music to suit all tastes, a comprehensive selection of classical music, recordings of the cathedral choirs, nostalgia, Christmas music in every genre and more. We also supply to order. If we haven't got what you want, we can probably get it in for you! The Christian bookshops in Barnsley all closed over several years up to 1995 when we opened our bookshop, Dale Books and Cards, which has gradually grown from that time. We believe God has given us a vision to resource people and churches hence the change of name during July 2013. We stock Bibles, books for children and adults including Bible studies, daily readings and Bible helps along with concordances etc. We also stock gifts including candles & pottery, greetings cards and stationery etc. as well as pens, pencils, activity books and many other Sunday School/children's resources; Christian DVDs and CDs; jewellery; fairtrade goods from Traidcraft and other fairtrade organisations — if we don't stock it we will order it!!! We support various missionary societies by selling their goods. We try to source all our goods from Christian businesses in order to support their trade. As part of Worsbrough Community Church's outreach programme, the Resource Centre exists to promote the Gospel, thereby introducing Jesus by resourcing churches and individual people. Our shop supplies many new gifts and Christian books, Bibles, videos, CDs, commentaries, daily reading material and greeting cards. Not ceased trading? Please get in touch.